My mother’s maternal grandfather’s mother was Amy Turner Keithley. 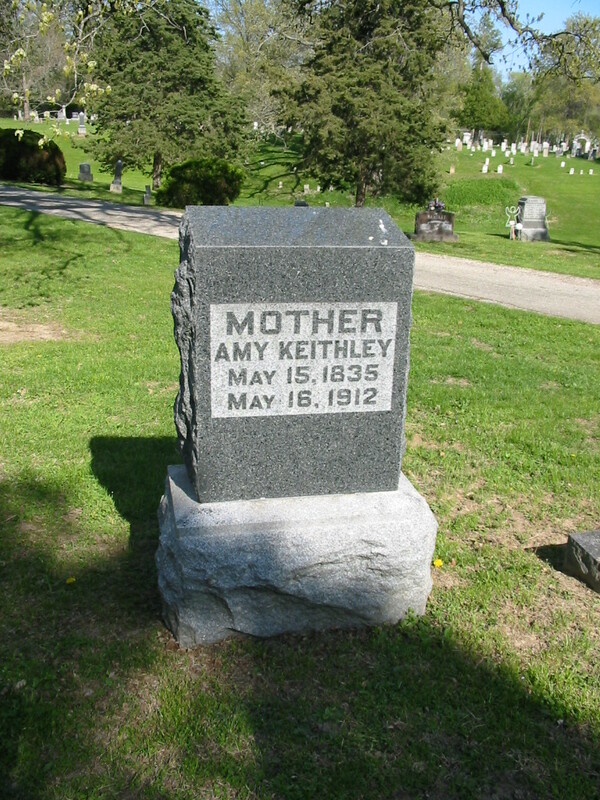 Amy was born Friday, May 15, 1835, in Sharon, Hamilton, Ohio to Elisha Turner and Sarah Morse. Sharon was eventually incorporated into the town of Sharonville, which is a part of the greater Cincinnati metropolitan area. The family was still in Ohio for the 1840 census but by the 1850 census, Amy and her parents were enumerated in New Diggings, Lafayette, Wisconsin where her dad was a miner. Amy married Enoch Keithley on August 29, 1852 in New Diggings. We had a difficult time finding a marriage record because the name was recorded by the court clerk based on the way it sounded. The ending ‘k’ sound of Enoch’s first name apparently meshed together with the beginning ‘k’ of his last name and the clerk recorded the name as Enoch Ethley. Amy’s name also morphed into something the clerk thought he heard – Emma Turner rather than Amy Turner. Amy and Enoch had three sons: Joseph Henry (1853), Lewis Owen (1855) and Arthur H. (1857) and by the 1860 census had relocated a few miles away in Shullsburg, Wisconsin, which is also in Lafayette County. They were living near Amy’s brother, George, and his wife and both her husband and her brother were listed as farmers. The county was in the midst of a great civil unrest and in November 1861 and her husband, Enoch, enlisted in the Union Army. He left shortly after that and died at Shiloh, Tennessee in April 1862 leaving Amy a widow with three small boys: 9, 7 and 5. As was the case for most widows, Amy married again; she married Thomas Burgess on October 19, 1862 in Shullsburg, Wisconsin. They had a daughter named Edith in 1864. Unfortunately, the marriage to Thomas was not very long-lived; he left the marriage and Amy filed for divorce. She took back her former married name, which she also applied to her daughter Edith, who seems to have been called Sarah in early records. Her parents and brothers relocated from Wisconsin to Fulton County, Illinois and Amy and her four children joined in the move. Life was likely quite difficult for a widow with four children, evidence of which can be seen in the 1870 census. Amy and her daughter were enumerated together, but each of Amy’s sons was enumerated with a separate family; the boys were likely working on these farms for their keep. Joseph and Lewis were both living in the same town as their mother but Arthur was living in the nearby county of Tazewell, living with a family that appears to be non-related non-neighbor. By the 1880 census, Amy and her daughter were living with her oldest son, Joseph. Lewis had moved to Nebraska and Arthur to Peoria. Sometime in the mid 1880s, Joseph and his family moved to Missouri while Amy and Edith stayed in Illinois. Edith married Harold Lee Davidson in 1891 and Amy was enumerated in Lewistown, Illinois with the Davidson family for the 1900 census. Lewistown was in the same county as Fairview but a few miles away. By the 1910 census, Amy was living in Peoria, Illinois with her son, Arthur, and his family. The 1910 census for her daughter, Edith, indicated a disrupted family. Edith and her son were living without her husband and she stated she was the mother of two children, one deceased; which means during the decade between 1900 and 1910 she had another child who didn’t live very long [the older son was enumerated in the census]. I have been unable to find a birth or death record for the child. Amy’s oldest son, my great-grandfather, died in Joplin in 1911 and Amy died on May 16, 1912. She is buried in the Oak Hill Cemetery in Lewistown, Fulton, Illinois. Her daughter, who died in 1926, is buried beside her.